Tandem rigs, sometimes called “doubles” or “twin rigs”, can be highly effective rigs for catching bass, crappie, sunfish, perch, shad, and other species. There are a number of reasons why these rigs are effective. One advantage is that they allow anglers to have greater depth control. For example, an angler can effectively double the weight of a rig, while still maintaining a slow retrieve at mid-depth. In addition, the added weight of the rig helps anglers achieve longer casts. The action of two lures rigged in tandem can be remarkably different than a single offering. One of the most well known presentations involves lures of different sizes. When rigged and retrieved properly, these special rigs mimic a small baitfish chasing after its prey. The rig is known to sometimes incite strikes from fish. The reaction by predators to this presentation can sometimes be extremely aggressive, with double hookups a common occurrence. Jigs are often rigged in tandem. There are a number of configurations, each having its special application. Some rigs use jigs of identical weight, while others feature a heavy-light combination. The variations are endless, with anglers mixing sizes, colors, shapes, and lure types. To begin making a tandem jig rig, select a section of mono leader of the proper strength. The simplest way to attach the upper jig is by using a dropper loop or surgeon’s loop. Next the lower jig can be attached using an improved clinch knot or other knot. Finally, to complete the rig, a small swivel should be added above the upper jig. A similar version employs two leaders of different lengths, both of which attach to a common swivel. Larger versions of this rig sometimes employ a 3-way swivel for the connection. Angler preference determines the length of each leader and the size, color and style of each lure. One of the most well known tandem jig setups is used to catch anadromous shad and river herring. Each spring, these ocean dwelling fish migrate hundreds of miles upstream into freshwater creeks and streams. Although the fish do not feed heavily while migrating, they will strike a small, moving lure. To catch American shad, hickory shad, or river herring, anglers often rig shad darts in tandem, Choosing jig sizes or colors based on local preferences. Other anglers prefer flashy jigs such as small feathered versions, tinsel jigs, or lead heads rigged with curly tailed grubs. Tandem jigs can be highly effective for catching members of the bass-sunfish family. One advantage of these setups is that anglers can fish two sizes of lures on a single cast. 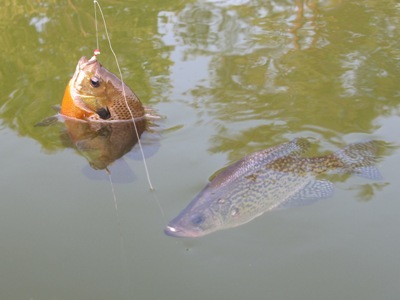 In addition to providing a unique presentation, this method of fishing allows anglers to target bass, crappie and sunfish all at once. Tandems are also useful for as live bait rigs. One popular tandem bait rig features a minnow on a bare jig hook, with a worm or other small rig trailing behind. Another popular tandem bait rig for catching species such a walleye, trout or salmon uses beads and spinner blade in front, followed by a worm rigged with a single or tandem hooks. These rigs are used to work a live nightcrawler or minnow very slowly along the bottom. Tandem rigs are not limited to mid-depth and bottom fishing. A little known but very effective tandem rig pairs a surface popper with a trailing fly or small baited hook. The rear hook is removed or disabled by snipping off the shanks. From the rear eye, a short leader extends back several inches, upon which a fly or live bait hook is attached. The rig is casted around structure and twitched. This action often draws out multiple species of fish. Top level predators such as bass or pickerel may attract the popper. If no large fish are present, a perch, crappie, sunfish or other fish may charge and take the trailing lure.